Classic midterm avoidance procedure: write a blog post. Anyway, the dog has been doing much better, and I owe that in part to my lovely new friends over at Hamlin Park dog park. I try and take him there at least 3 times a week so he can run around and be social. It’s kinda become a zen place for me too. So to thank everyone for being so nice and welcoming to us, I decided to make some dog-friendly (and vegan, of course) cupcakes. Recipe stolen and modified from here and here. In a medium sized bowl, mix together the flour and baking soda. Add the rest of the ingredients and mix well until combined. Put liners in a mini cupcake pan. Ball up a rounded teaspoon of batter and drop into each cupcake cup. Bake for 15 minutes (until firm and beginning to brown). Should make around 24 cupcakes. Mix until combined, add honey to taste. 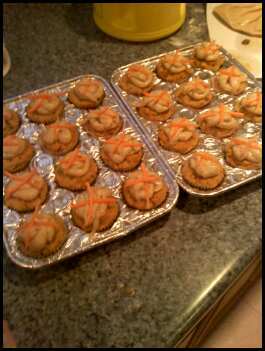 Pipe frosting onto cupcakes and top with shredded carrots. NB: I used creamy soynut butter, so that plus the 1/4 cup oil was a little too much for my liking. If using creamy peanut/soynut butter, I suggest using only a couple tablespoons oil.